If I was 20 years old right now and indulging my hippy tendencies to their fullest, I would not be following the Dead as my friends and I did when we were that age. I’d be getting a case of good Kentucky Bourbon, and all the other hippy things you need, and getting in a VW microbus and following My Morning Jacket around. These guys are absolutely incredible to see live. Jim James’ voice and the raucous wailing guitars with the trippy sounds they create just have to be seen and heard live. The Gotham Gal and I did just that last night at Roseland and while we did not have a great view (got their late and MMJ has serious fans), we did get to see something truly special. 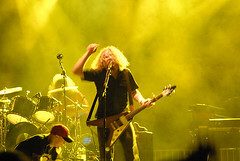 If you want to see what a great hippy jam band looks like in 2006, just google My Morning Jacket and find a show near you and go. You won’t regret it. I didn’t video any of the show last night due to our poor view but here’s a short clip (1 min) of the solo during Off The Record, recorded a couple weeks ago in Austin Texas. Enjoy.